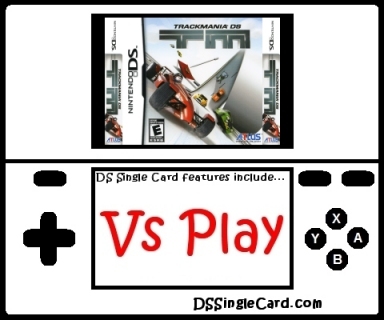 Basic game navigation in TrackMania DS is simple, if not a little more tedious (extra steps) than other Nintendo DS games. "Multiplayer" is right on the main menu and "Single-Card Play" immediately follows on the Multiplayer menu. The opening credits are a little on the long side, but the download timing is faster than average. The touch screen menu navigation is pretty accurate with menu options clearly labeled in a single-column list format. The options are a little small and could easily be larger, but it's not a big enough issue to cause a drop in points in this review. The menu options accept on a single tap for quick navigation, but this also means that a mis-tap will result in a player entering an incorrect area, but this is not a fault, just a design choice. The in-game controls for TrackMania DS are entirely button-based: there are no touch screen controls at all, clunky or otherwise. The button controls, and the physics assigned to the appropriate action are spot on, giving players exactly what they expect. All of the button mapping the programmers did assigns actions to the most natural positions (looking at the classic racing button mapping) so that players pick up on them quickly and instinctually. Graphically, TrackMania DS features fully-detailed, excellent looking 3D, with a proper sense of depth when driving. The audio provides both sound effects and mood, and the game is easily more enjoyed with the sound on. In terms of in-game features, there are three racing modes: Time Attack, Championship, and Rounds. In Time Attack, racers race through the tracks, one at a time, with as many attempts per track as they can fit into a pre-set time limit. In Championship, racers get one shot at each of the course on the path to one player reaching 50 points first (and a second shot if nobody reaches 50 points after each course has been raced on). In Rounds, players race on the same track until one player reaches a preset number of points before moving onto the next course. The same five courses are used in all of the modes. Every time I pick up the next racing game that's been developed by Firebrand Games, I go into the experience expecting something great, and all of their recent outings have succeeded. Their racing engine is spectacular and everyone wants their services: so far, they've been published by Codemasters, Atlus, and Electronic Arts. One of the highlights of their engine (in terms of the single player experiences) is their track creation feature. So far, none of their games have brought created courses into Single-Card Download play, but they got one step closer with TrackMania DS: all of the races are on the type of tracks that can be created in the creator, and all of them are different. They show off the wide variety that the track creator is capable of. The racing in TrackMania DS's Single-Card Download play is different in that racers' cars can't interact with each other. In fact, multiple cars can take up the same space at the same time. This provides some advantages and some disadvantages. On the advantage side, all racers start from the EXACT same place and can't be messed with by other racers. On the disadvantage side, you can't mess with other racers. It's a double-edged sword, but I personally think that the advantage side has the edge. Overall, it's a great racing title and the Single-Card Download play has a terrific level of replayability. Increase the size of the options' tappable areas within the game's menu. Offer optional controls scheme choices for new-to-the-game race fans that may be familiar with other racing games' button mapping. Allow custom tracks to be raced via Single-Card Download. Make more of the pre-made tracks and drivers available via Single-Card Download. Let players race side-by-side on larger (wider) tracks with interactions. Click here to return to the DSSingleCard.com TrackMania DS profile.